Bryan Hall, left, with Education Secretary Betsy DeVos and Robert Rader. Almost two years ago, Secretary of Education Betsy DeVos was speaking to a congressional panel when she singled out East Hartford as one of the nation’s failing school systems. She told the story of Michael, a student who she said received little support from teachers and administrators. The remarks infuriated East Hartford educators and many of the state’s elected officials, who said the characterization of the schools was not accurate. They held a rally and East Hartford Schools Superintendent Nathan Quesnel and others invited DeVos to visit the school and examine the quality of education for herself. But, according to East Hartford Board of Education Chairman Bryan Hall, no one heard back from DeVos and she never visited. On Monday, Hall had a chance to meet the secretary himself and issue that invitation one more time. This time, the outcome was different. “She said she’s looking forward to coming to East Hartford,” Hall said. Hall was in Washington, D.C. attending a meeting of the National School Boards Association at the Washington Hilton. 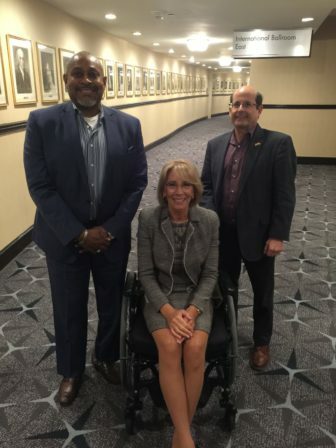 He heard that DeVos would also be at the conference and attempted, with the help of Robert Rader, executive director of the Connecticut Association of Boards of Education, to set up a short meeting with her but had no luck. However, he and Rader strategized about the secretary’s departure route and were able to intercept her on her way out. Hall said that DeVos had been in a bicycle accident and was in a wheelchair. He didn’t ask her for an apology or chide her for her comments. Instead, he simply reminded her of her comments about East Hartford High School, handed her his card and invited her to visit to see how “phenomenal” the district is. Hall said shortly after he met with DeVos, he received a note from her staff saying how “lovely” it was to meet him and asking him to formally request a visit from the secretary by filling out a form. Attempts to reach DeVos and her staff were unsuccessful Monday night.